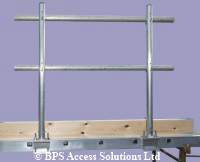 These aluminium brackets simply clamp onto staging boards to support hand rails, knee rails and toeboards as required by Health & Safety regulations. Universal design - fits all sizes of our staging boards (Any width or length). Will also fit other staging boards with a stile thickness/depth of 32mm or 36mm. Strong jaw-lock clamps simply bolt to the stiles to provide quick and easy fitting. 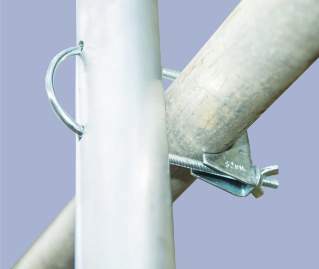 Integral U-bolts secure handrails on either side of the bracket. These U-bolts allow you to fit various sizes of tube including standard scaffold poles/pipes (not included). 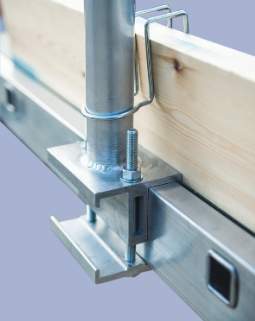 Toeboard clips will accommodate different sizes of board, including standard scaffolding planks/boards (not included). More compact for storage and far less susceptible to damage than the traditional 'L' Frame staging board handrail brackets. Handrail brackets are to be fitted approximately every 1.8m (6') along the platform. (Select the length of staging board you have from the right hand side to get your price). Includes easy to follow pictorial instructions which are written in plain English. PLEASE NOTE - does not include scaffold poles for handrails and scaffold planks for toeboards.